This just in: the world’s most famous basketball player is indeed the messiah, and the people of Cleveland are His chosen ones. And this reporter, stationed in Cleveland for the summer, has taken it upon herself to evangelize the nation, spreading the gospel of “The New King James” for the sake of your salvation. When the news originally broke on Friday, local news stations were initially occupied covering the conflict in Gaza. News of The King’s return halted all coverage of the sort, however, which clearly indicates that the violence has ended. It truly is the second coming; the messiah’s arrival has ended all religious dispute. James was born in Akron, Ohio, just outside of Cleveland, to a single mother. The details of his conception are yet unknown, and he has never met his father. However, LeBron still acknowledged a higher power in his life: that of the holy sport of basketball. 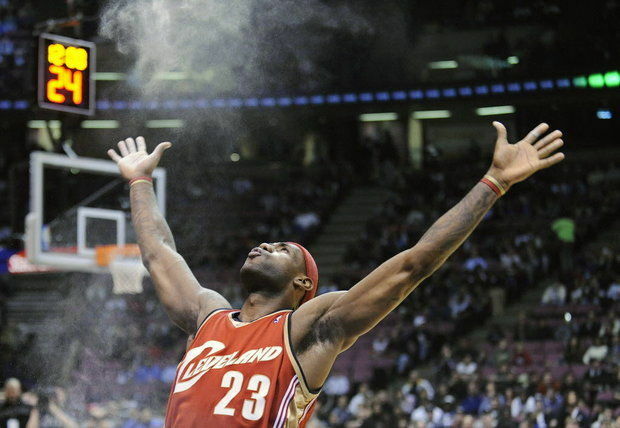 He amassed a huge following, steeped in rituals such as the ceremonial throwing of chalk dust into the air, and the slogan “We are all witnesses.” In fact, the stance that James would take when tossing this chalk has often been mistaken by Cleveland newscasters for the statue of Jesus in Rio de Janeiro. Four years ago, LeBron James left his people. Many of his fans, such as the Cavaliers’ owner Dan Gilbert, denounced James as a traitor for his cavalier decision to leave the Cavaliers. Some former apostles even burned his jerseys in effigy. His decision to return was not an easy one, by any means, and he did not make it quickly. Loyal fans were forced to wait, worry, and wonder, “Is he really gone for good? LeBron, LeBron, why have you forsaken us?” His homecoming, however, brought only tidings of great joy to Cleveland. There have been celebratory ceremonies all over the city, and miraculous instances of jerseys being restored from the ashes. This being his second coming, LeBron James is of course willing to give you all a second chance as well. A second chance to believe, to become a worshipper and fan of both James and his disciples, the Cleveland Cavaliers. James has even coined the word “forgiven” to account for Cleveland’s doubts and his own efforts to atone for the city, granting them salvation due to his belief that these people truly do deserve his great talent. “Le” and “Bron,” respectively French for “the” and Dutch for “well,” will be indubitably the source from which the Cavaliers will draw their impending coronation as champions of the National Basketball Absolution. Although James has particularly chosen the people of Cleveland to call his own, he has returned for all those who love him and the Cavaliers, including followers from all over the state, country, and the world. The championship that undoubtedly awaits the Cavaliers will be a universal reward for the faithful. The city of Cleveland, however, can expect more than a basketball championship in return for their earlier sufferings. Just this week, Cleveland was named the site of the 2016 Republican National Convention, and hundreds of conservative Christians will be making their pilgrimage to this holy site. This is not to mention the economic salvation that also accompanies both of these events. Cleveland, Ohio will finally make its ascension to the Kingdom of King James, undoubtedly the home of the true messiah.